Thrissur/ Thrissivaperoor pooram commonly called ‘the pooram of all poorams’. It is one of the mammoth pooram festival in kerala. It has been celebrated every year in Medam ( April) month, as per malayalam calendar, at Vadakkumnathan temple, situated on famousthekkinkadu maidhanam, a hillock right in the centre of city, which is a classic example of Kerala style of architecture, is made spectacular by the pageant of 30 caparisoned elephants and kudamattom, a competition involving swift rhythmic changing of brightly coloured and sequined parasols. Ilanjitharamelam, an amazing percussion ensemble featuring about 250 odd artistes, ushers in tens of thousands of music-lovers, who wave their hands in accordance to the rhythm generated by the chenda, kuzhal, kombu and elathalam (traditional instruments of Kerala). An astounding firework would light up the sky to provide a grand finale to two days of classic entertainment. The pooram starts at the time of Kanimangalam sasthavu ezhunnellippu in the early morning and followed by the ezhunnellippu of other six temples. One of the major event in Thrissur pooram is “Madathil varavu”- is a panchavadhyam melam, participating more than 200 artists, consists of Thimila, Madhalam, Trumpet, Cymbal and Edakka (Different types of instruments). At 2’ O clock, inside the vadakkumnathan temple starts the famous Ilanjithara melam – a type of melam consists of drum, trumpets, pipe and cymbal. 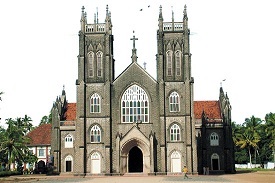 Arattupuzha is a culturally significant village located in Thrissur district of Kerala. This village, about 15 km from the town of Thrissur is renowned for the annual festival called Arattupuzha Pooram. The Sree Sastha Temple, dedicated to Lord Ayyappa, which is believed to be more than 3000 years old and its premises are the venue for the festivities. 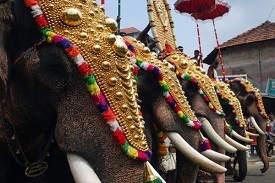 Arattupuzha Pooram is an all-night festival centred around a procession of 61 elephants that are decked to glory. This festival is an elephant pageant of sorts and also provides the backdrop for several traditional percussion groups of the nearby areas to showcase their performances. About 23 deities from the nearby areas are brought to this place and ritualistically worshipped throughout the seven day festival. On the sixth day evening, the procession of elephants begins around 7 pm and goes on into the early morning hours of the next day, culminating with all the elephants facing the east to welcome the sun. During the Malayalam month of Meenam (March-April) Peruvanam temple in Cherpu attains a special charm and majesty. And the reason is the Peruvanam Pooram, a festival that has a legendary status because of it antiquity. Lord Shiva is the presiding deity of this temple. Legend has it that the present sreekovil (sanctum sanctorum) was originally a tree on which Lord Shiva did tapas (meditation). he first main Pooram on the day is of Aaraattupuzha Sastha. The deity arrives at the temple through the southern entrance (Gopuram) before sunset. Seven elephants decorated with exquisite ornaments stand in a row facing north, but, exposed to the rays of the setting sun. That is a sight that will linger in the mind for all time to come. An elaborate Pandi Melam commences immediately under the leadership of Padmashri Peruvanam Kuttan Marar. After about 30 minutes the deity moves towards the eastern entrance (Gopuram) and enters the walkway facing east. All the Bhagavathies, starting with the one from Pisharikkal, conclude the celebration with a ritual bath at the temple pond, called Thotukulam. Each deity performs the bath immediately after the conclusion of one’s own Pooram. Regarding the history of Uthralikavu, there is a story told by the elders about this temple in Enkakad. They say, the name Enkakad is derived from the word Thinkalkadu meaning the hair of Siva ( thirujada ) in which moon resides. Lord Siva begged rice from the hill nearby called Uriyarikunnu (Uriyari—about 150 ml of rice) and with the rice so received, he prepared his dinner at a nearby place. This place was called Vechanad in Malayalam, which later became Machad. Lord Siva found this place so beautiful that he gave seats here to the two goddesses (Bhagavathies), one at the north east i.e., Akamala for Rudrakali (Rudhiramahakali or Uthrali as known now) and the other at south i.e., near Vazhani for Thiruvaani (Vaani means voice, speech,music etc.). It is also believed by the local people that Thiruvaanikavu Bhagavathi is elder sister of Uthralikkavilamma. Accordingly, Thiruvanikkavu Vela / Pooram (better known as Machad Mamankam or Kuthiravela) takes place one week prior to Uthralikavu Vela / Pooram. About twenty-one elephants in traditional attire line up with colourful parasols; swayingvenchamarams (white tufts) and alavattams (peacock-feather fans)! Surely a spectacle you wouldn’t want to miss. Then ensure your presence during the annual festival at the Sree Ruthira Mahakalikavu Temple, popularly known as Uthralikavu Pooram.Sree Ruthira Mahakalikavu Temple is dedicated to Goddess Kali. Uthralikavu Pooram is the most famous event in the region. It is an eight-day celebration highlighted by day and night elephant processions. Traditional musical ensembles like the Panchavadyam and thePandimelam add rhythm to these processions. The festival also gives a chance for the spectators to enjoy the temple and folk art forms of Kerala. Chinakkathoor Pooram is a prominent festival of Ottapalam Taluk in Palakkad District. In the ancient days this taluk was Known as Valluvanad. It is the most glorious and georgeous festival of Ottapalam which was noted as the cradle of art Malabar. Imagine a grand spectacle where about 33 tuskers come together in a grand procession, offering a spectacular visual delight. Interested? Then get your bags ready for a trip to Kerala to savour this fabulous visual fiesta. Chinakkathoor Pooram is the name of this festival of colours and tuskers, held annually at the Sree Chinakkathoor Bhagavathy Temple, Palappuram in the district of Palakkad in north Kerala.Chinakkathoor Pooram would come alive with performances of the Panchavadyam - the traditional Kerala orchestra - and various art forms like vellattu, theyyam, poothanum thirayum, kaalavela, kuthiravela, aandi vedan, karivela and so on. Tholpavakoothu, a ritualistic shadow puppetry, is another attraction of the festival. Chinakkathoor pooram is celebrated on Makam Day in the Malayalam month of kumbham which recollection is the vigour and spirit of Mamankam. Valluvanad, the cultural capital of Malabar offers the exquisite beauty of customery arts and Folklores on this occasion in a grand manner. The spectacular procession of 27 caparisoned tuskers with the accompaniment of panchavadyam and pandimelam provide a colourful show to the viewers of Valluvanad. We can see a torrential flow of traditional arts and folklores like pootham, Thira, Pulikkali, Kumbhamkali, Kudakkali, Theru (chariot), Thattinmelkooth (Dance on the platform) with inexhaustible energy and indomitable enthusiasm to the much acclaimed soil of Chinakkathoor Temple on the same day. The celebration of the above arts provide a footstomping music and influential step which pervade the artistic vision of valluvanad.. The swashbucking performance of pulikkali & Ox Play (kaalakali), ear-breaking sound of para (drum) of Thira & Pootham), Variety of attractive illuminated Panthals, intensive movement of jubilant mob to chinakkathoor neglecting the penetrating heat of kumbham which reveals that nothing else can substitute this festival. On the pooram day, people of Chinakkathoor Thattakam (place) would assemble on the temple ground irrespective of caste and religion to celebrate the festival bidding farewell to their crisis and struggles. Every one would like to participate in the predominant game of Chinakkathoor Pooram. Kollam Pooram is a ten-day festival that is held in the month of April. Kollam Pooram is one of the most colorful festivals celebrated in the city. The festivities of Kollam Pooram include a huge procession. People from the different parts of the district of Kollam come to join in the procession Kollam Pooram is related to the annual festival of Asramam Sri Krishnaswamy. The festivities of Kollam Pooram begin with the Pooram Ezhunallippu ritual, which is followed by the feeding of elephants. In fact, the Kollam Pooram festival in Kollam is characterized by a number of rituals such as Ezhunallippu ritual, Araattu Ezhunallippu and Kudamattom ritual. 30 elephants take part for the Kudamattom ritual. Following the tradition of the festival of Kollam Puram, these 30 elephants are divided into 2 equal groups. Each of the groups is considered as the representatives of the Puthiyakavu Bhagawathy Temple team and the Thamarakulam Sri Mahaganapathy Temple team.similar to the Thrissur Pooram which is world famous. he deities of the nearby temples partake in this festival and on the pooram day, in the morning, these deities come on caparisoned elephants to pay homage to the Sree Krishna deity at Ashramam. This is known as cherupooram. 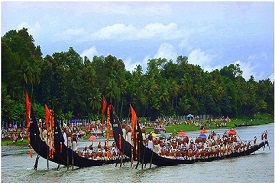 The grand spectacle of the festival, Kudamattam ceremony is carried out by late afternoon. It is a ritual in which 30 tuskers split into two groups of 15 each, representing Thamarakulam Sri Mahaganapathi Temple team and the Puthiyakavu Bhagavathy Temple. Kudamattam which is held to the beats of traditional melam is followed by a spectacular fireworks display. 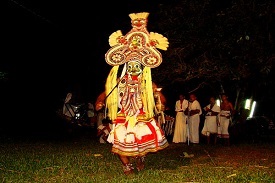 Several cultural programs like ganamela, kathakali etc are organised during the festivel days.